Challenge yourself to read more this year by participating in our Read Through the Year Reading Challenge for adults. The program runs from January 21st-December 14th but you can count any book you’ve read since January 1st, 2019. You can participate online using Goodreads or stop by the Help Desk to sign up for our “on paper” version of the program. Find out more about participating in our Read Through the Year Reading Challenge online here. Choose your reading goal and if you choose to read at least 10 books this year and meet your goal you will be entered in our grand prize drawing for a $100 gift card to Walmart or Amazon. You will also earn points for each book you read towards our raffle prize drawing. Raffle prizes include $10 gift cards to Jitters, Walnut Creek Cheese, Walmart and Amazon, $25 dollar gift cards to Jitters, Walnut Creek Cheese, Walmart and Amazon, and $50 gift cards to Walmart and Amazon. Kids ages 2 – 12 – join us for some winter reading fun – Reading in a Winter Wonderland. 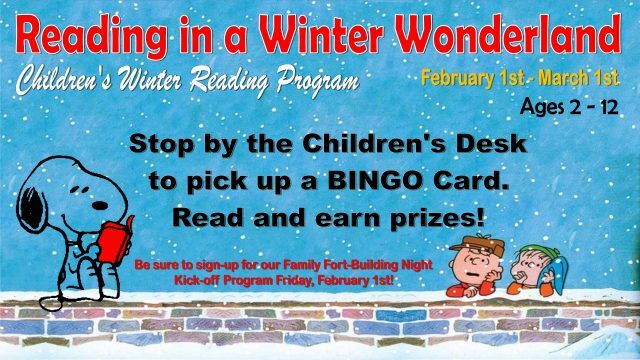 Stop by the Children’s Desk at the Central Library or East Branch beginning Friday, February 1st to pick up your BINGO Card. Read books in a variety of categories to complete 1, 2 or 3 BINGOs to earn prizes. Be sure to join us for our after-hours kick-off program – Family Fort-Building Night on Friday, February 1st @ 6 pm. Registration required. Click here for more information. Turn in your card on or before Saturday, March 9th to be entered into a Grand Prize Drawing. For more information contact the Children’s Department at 330-674-5972, ext. 211 or the East Branch at 330-893-3464. Check back later this year for our summer reading programs for children, teens and adults! In the meantime check out the other reading programs we offer by using the tabs on the left. Any child from birth to the day they enter Kindergarten is eligible. Sign up for the program by visiting the Children’s Department at the Central Library or the East Branch in Walnut Creek. Pick up your child’s keepsake reading log where you will keep track of the books reads by recording it’s title, author and date read. 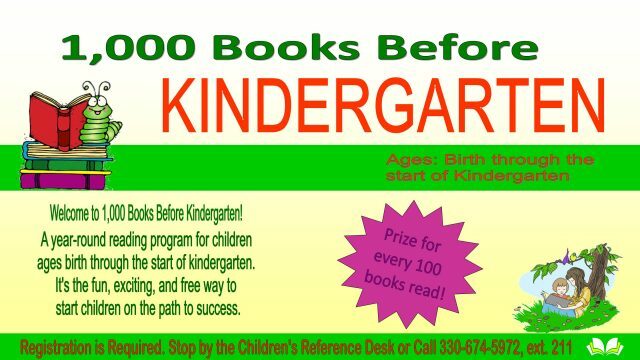 For every 100 books read, bring your child’s log to the library to receive a prize. For the 200th, 400th, 600th, 800th, and 1,000th book read, your child will receive a book of their very own to keep. When your child has finished 1,000 books, bring them to the Library for their final prize and to have their picture taken. The Library will host a 1,000 Books Before Kindergarten graduation party each year. Check with the Children’s Department for date and details. A book read by any family member, teacher, etc. as long as they listen to the whole story. How Long Does It Take to Read 1,000 Books? Take every chance you have to read with your children, tell and talk about stories, say nursery rhymes, and sing songs. Expose your children to a variety of different types of stories and vocabulary. It is completely normal and expected for children, especially very young children, to have their favorite books that they want to hear over and over again. When you have the opportunity, introduce new stories so that your child has a chance to experience and hear many new words and concepts as possible. Phonological Awareness-is being able to hear and play with the smaller sounds in words. Vocabulary-is knowing the name of things and concepts. Print Motivation – is the enjoyment of books and reading. Print Awareness – being familiar with printed language and understanding that it is useful. Narrative Skills – being able to describe things, to tell what happened, to retell stories. Letter Knowledge – knowing that the same letter can look different, that letters have names, and that letters are related to sounds.